Fashion Revolution Day is a day of international mobilisation to improve the way our clothes are made. Last year I asked fashion brand L’Herbe Rouge who made their clothes. 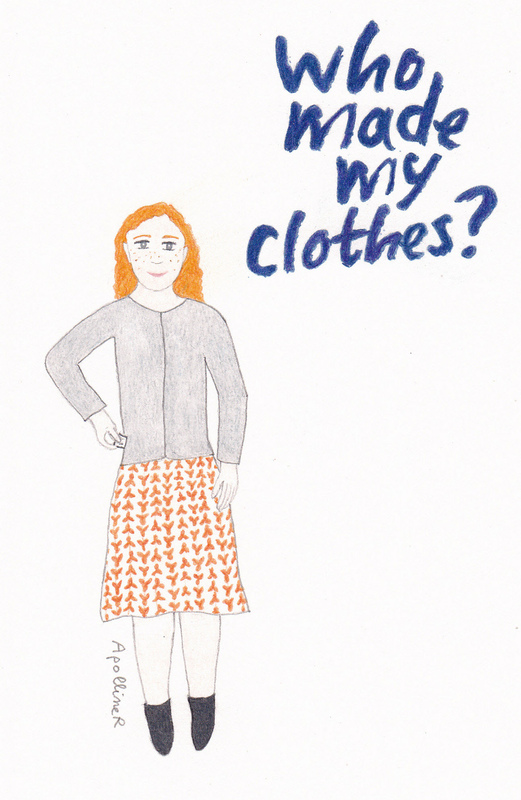 This year I asked the same question to ethical fashion brand People Tree. I have the same cardigan as the character on my drawing. She is also wearing a dress from the Orla Kiely for People Tree collection. My cardigan was made at Rajlakshmi Cotton Mills in India. Rajlakshmi uses mostly Organic and Fair Trade cotton and works to ensure Fair Trade is practiced throughout the supply chain right down to the cotton farmers from Maharashtra, Odisha and Andhra Pradesh. Brands like People Tree show that it’s possible to have a traceability of clothes. Fashion Revolution Day’s goal is that all fashion brands set up traceability systems for their products to prevent abuse by some subcontractors. Fashion Revolution Day is an opportunity to tell brands that their clients ask for more transparency.